Preheat the oven to 120°C/250°F. Mix the cream cheese in a bowl of a stand mixer fitted with the whisk attachment until fluffy, or approx. 4 min. Stop the mixer, scrape down the sides, and return the mixer to low speed. Slowly pour in the sugar and salt and mix on low speed until combined. Meanwhile, whisk half of the water and the cornstarch together in a small bowl. Add the sour cream and pistachio paste into the cornstarch-water mixture, and whisk until incorporated. Add the vanilla extract and rest of the water. Stop the mixer and scrape down the sides. Over low speed add the pistachio-sourcream-water mixture. Gradually raise the speed to medium-high and mix until fully incorporated. Slowly turn the mixer to low speed and add the eggs and yolks, one at a time, until each is incorporated. Stop the mixer and scrape down the sides, then add some of the matcha powder and mix on medium speed one more time. Place springform pan in a baking dish and add boiling water halfway up the cake tin. Make sure there is no water in the cake tin, and add the cheesecake mixture. Carefully transfer to the oven and bake for approx. 50 min., or until it is set, but a little jiggly. Remove the cheesecake from the baking dish, cover with plastic wrap, and refrigerate for at least 2 hrs. and up to 2 days. 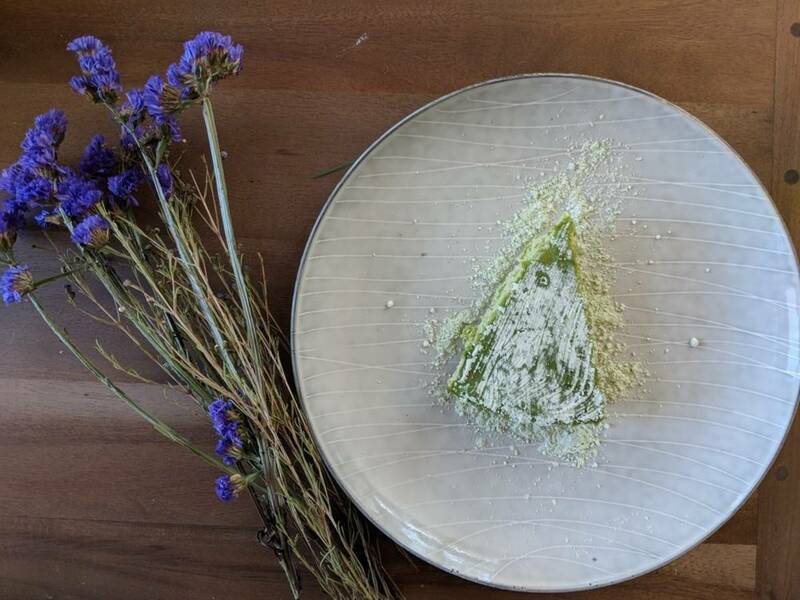 Just before serving, dust the cheesecake with mixed confectioner’s sugar and matcha powder. Cut out slices. Enjoy!